Walter William "Walt" Weiss (born November 28, 1963) is a former shortstop in Major League Baseball. He managed the Colorado Rockies from 2013 through 2016. Weiss was a member of the 1998 National League All-Star Team. He also won the 1988 Rookie of the Year award. Initially drafted by the Baltimore Orioles in the 10th round of the 1982 amateur draft, Weiss decided to put his professional baseball career on hold and attended the University of North Carolina at Chapel Hill. In June 1985, he was the 12th overall pick in the 1985 draft. At the age of 23, he made his first major league appearance for the Oakland Athletics in September 1987. The club was impressed enough with the young shortstop's talent that they traded starter Alfredo Griffin that December, making him their starting shortstop for 1988. His offensive numbers were low (.250 average, three home runs, 39 RBIs and 44 runs scored), but his defensive wizardry helped lead the A's to their first American League pennant since 1974. The 1988 World Series was a rematch of the 1974 matchup, with the Los Angeles Dodgers winning the National League pennant. His costly error in Game 4 helped the Dodgers win the Series in five games, but he was voted American League Rookie of the Year for 1988 as the third consecutive Oakland player to win the award after sluggers José Canseco in 1986 and Mark McGwire in 1987. He also made the 1988 Topps All-Star Rookie Roster. In 1989 Weiss' offensive numbers didn't improve as he battled through injury and adversity even though the A's repeated as AL pennant winners, meeting their crosstown rival San Francisco Giants in the 1989 World Series. Although the Series would be overshadowed by the Loma Prieta earthquake on October 17 which delayed play for ten days, Weiss homered and the A's swept the Giants to claim their first world title in fifteen years. 1990 saw Weiss put up his best offensive numbers to date in hits, runs and batting average, while also stealing nine bases. The A's won their third straight pennant, but Weiss was injured in the 1990 American League Championship Series against the Boston Red Sox and missed Oakland's 1990 World Series loss to the Cincinnati Reds, four games to none. Limited by prior injuries, he didn't play much in 1991 as the A's missed the playoffs for the first time since 1987. In what would be his final year in Oakland, he hit .212 in 1992 and was traded to the new NL expansion Florida Marlins during the offseason. He played in 158 games in 1993 for the Marlins, but after the season became a free agent, chose to sign with the Colorado Rockies (which like the Marlins were a new NL expansion team in 1993) and was the first player to play for both of these 1993 expansion teams. Weiss spent four modestly successful years with the bat in Colorado, posting career highs in home runs (8) and RBIs (48); but his strengths lay in solid defensive play at shortstop and ability to reach base (.351 lifetime OBP). In December 1997, he signed with the Atlanta Braves and became their starting shortstop, hitting .280 and making the All-Star team for the only time in his career in 1998. The Braves finished with 106 wins but lost the NL pennant to the San Diego Padres, but he was slowed by injuries and appeared in less than a hundred games for the first time since 1991. The next season, his decline continued with a disappointing .226 batting average. In Game 3 of the 1999 NLDS against the Houston Astros, however, he made a stunning defensive play to save the season. In the bottom of the tenth, with the bases loaded, one out and the score tied, Tony Eusebio hit a sharp grounder up the middle. Weiss ranged hard to his left, fell on his stomach and threw to home for the force. After the game, he said the ball nearly ripped the glove off his hand. Weiss and the Braves went on to win the game, and with it the division series, on their way to the NL pennant and the 1999 World Series, which they lost to the New York Yankees. In 2000 he only had 192 at-bats, mostly due to losing the starting shortstop job to the emergent Rafael Furcal, who would go on to win Rookie of the Year just like Weiss twelve years prior. He retired after the season. Weiss' charitable contributions have included numerous donations to Watertown High School in Watertown, New York. In addition, the baseball field at his alma mater, Suffern High School, is named after him. After retiring from the Braves as a player following the 2000 season, he returned to the Rockies as a special instructor and adviser to the front office from 2002 to 2008. He left that job to spend more time with his family, but eventually returned to baseball as head varsity coach for Regis Jesuit High School in Aurora, Colorado, where in his first season in that capacity he led the team to the 5A semifinals. 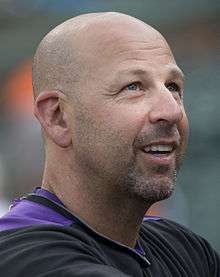 Weiss was signed on November 7, 2012, to be the manager of the Colorado Rockies. Weiss made the decision to step down as the manager of the Colorado Rockies after 4 managerial seasons with the club on Monday, October 3rd, 2016  He finished with a record of 283 wins and 365 losses. 1 2 3 "Walt Weiss". Baseball reference. Sports Reference LLC. Retrieved October 4, 2016.